Andy Lynch, who is helping to launch a new Castleford Tigers physical disability team. Castleford Tigers’ charitable arm, The Tigers Trust, are launching a Physical Disability Rugby League team. The new team will provide an opportunity to play the game for those who would not usually get the chance. 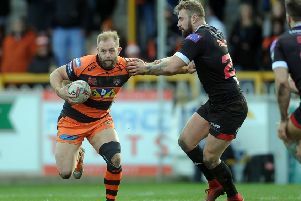 Training sessions will take place at the Mend-A-Hose Jungle and the team will get the chance to challenge themselves in games against other Super League clubs. To launch the team an open training session will take place at the Mend-A-Hose Jungle next Wednesday, starting at 5.30pm. The team will be jointly coached by recently retired Castleford player Andy Lynch and Tigers Trust development officer Neil Barnaby. Speaking ahead of the launch, Lynch said: “We can’t wait to get started on this project, it doesn’t matter what ability level you are, or if you’ve never played rugby league before, this is your chance to give it a try. PDRL is a mixture of non-contact and full contact rugby league and can be played by anyone aged six plus through to adults of any age and of either gender, provided they have a disability. Registration forms can be downloaded from the Tigers website and anyone interested can take it with them to go along to the open training session.